TAO GROUP BLOG TAO NIGHTCLUB LAVO NIGHTCLUB TAO BEACH LAS VEGAS: TAPOUT INVADES LAVO! Pre-fight festivities and New Year’s Day celebrations were underway at LAVO and TAO on Friday. 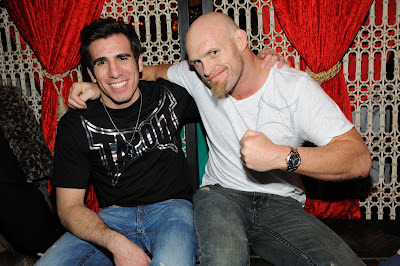 Tapout fighters Kenny Florian and Keith Jardine hosted the night at LAVO and started downstairs in the restaurant with a dinner that included the restaurant’s famed Kobe Meatballs, Stuffed Lobster, Calamari, Filet Mignon and more. After dinner they made their way to a VIP table on the dance floor, where the fighters stuck mostly to Red Bull and water while their friends imbibed with Belvedere and Patron. Also spotted at a dance floor table in the nightclub at LAVO was funnyman David Spade, who was drinking Don Julio Anejo with a Pepsi back. Over at Tao, Sum 41 rocker Deryck Whibley continued his New Year’s celebration with a sushi filled dinner at the Asian bistro and then made his way to the nightclub with friends. Earlier in the night Nelly dined at Tao with a group of friends. The rapper left the ordering to the sever and dined on Sea Bass, Swordfish, Crispy Shrimp and more, accompanied by Sokol Blosser Pinot Noir. Model Devon Aoki dined at TAO with two girlfriends, as did E!’s film critic Ben Lyons, who along with a group of ten friends headed up to the nightclub after dinner.